What is it about the Labyrinth that just gets my creative juices flowing? It might be that I watched this movie so much as a child and therefore a lot of the creatures formed this basis in my brain for creativity and creation. Foremost, it seems all of Henson's characters in the Labyrinth, aside from the humans, would make good masks! Think about it! Ludo? Excellent mask idea! A Firey (Chilly Down)? Heck yes (I actually have a Firey mask that is not too far along but in serious planning stages too!)! To start I worked on making a horn out of polymer clay while studying a picture of Ludo. I have used regular water-based clay before but it almost always seems to break on me. I then have to dig out the rest of the clay and it's just no fun! The great thing about having a nice polymer clay horn is that I can reuse it over and over again too! While the horn was baking it was time to work on the base for the mask. I knew I wanted to cut this mask off above the lips and went about making it accordingly. I don't have a lot of pictures of the in between process here because I moved along pretty quickly. But I started by making the shape on one of my armatures. I then realized by looking at Ludo's head and horns that I would need to add an extension to the forehead to pin the horns too. I cut out some cardboard for this and in many series of letting the plaster dry and then adhering on top of it, got the horns and everything put together. Kind of reminds me of a witch doctor! The big problem I had once this was all said and done, was that it was kind of flimsy in between the horns on each side of the forehead. I ended up reinforcing the whole frame of the mask as well as the horns and forehead with some wire. This went very well, but next time I will not go with the figure 8 shown below and will instead stick with the edges and through the horns. I will have to spend some time making the wire flush with the surrounding mask or else it's going to dig into your forehead. Sometimes I wish I'd think of these things ahead of time, but a lot of creation is trial and error! Now for the biggest hold up on this mask!! I've got my total base ready to go now for the most part and the only thing I can think of, even though I have plenty of sculpting yet to do, is of Ludo's muppet hair. I must have spent 5 hours alone just researching the different furs available out there. 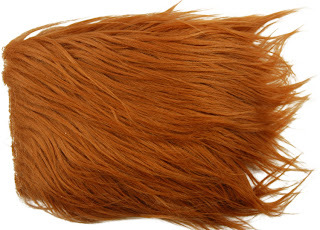 I started by looking up shag fake fur and could only find people selling the right color in yards for $30 or more! I would find smaller bits on etsy but never the right color. I looked into dying my own faux fur and found that apparently the only way to die dark colors in acrylic fur is very toxic and not suggested for beginners. Lovely! I finally found a solution in the most unlikely of place: fly fishing! Yes, that's right... fly fishing. There is more variety in color for fisherman to choose from then there is for crafters to choose from! I found the perfect color, orangutan rust, in a brand called Psuedo Hair. It's not quite the right texture so much as the Mongolian shag I found was, but at least I don't have to spend $30 for it, more like $3.50 which is way more affordable! I also found another brand called Extra Select that has a finer version of this fur that I will be using for my Firey mask. So now I'm waiting for my order of fur to come, and will work on sculpting the facial features onto the mask base in the meantime. I'd like to get this done either by next week or the week after.